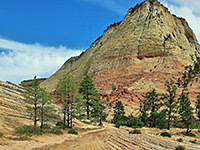 State highway 9, the main approach route to Zion National Park from St George and the west, continues eastwards a short distance after the park entrance along the floor of the deep canyon of Pine Creek, which is wide at first but soon narrows and becomes too steep for traffic. 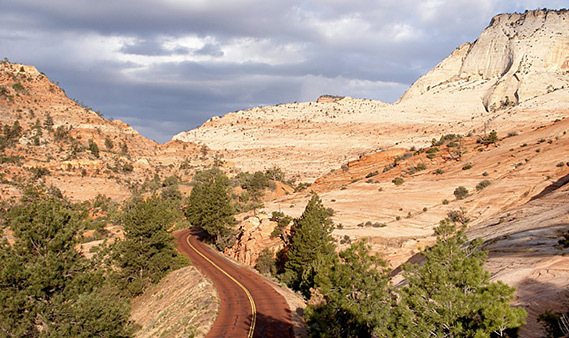 Instead, the road climbs by nearly 800 feet up the south side of the valley, curving through several tight switchbacks, then enters the 1.1 mile Zion-Mount Carmel Tunnel, in which the highway rises another 300 feet. The tunnel was completed in 1930, part of the 20 mile road to Mount Carmel Junction across very rough but scenic terrain that was considered an almost impossible project at that time. Just before the tunnel, the road passes a viewpoint of The Great Arch - a large, eroded semi-arch in the red sandstone cliffs. The tunnel is too narrow for large vehicles to travel safely in two-way traffic so it is periodically closed in one direction so that oversize vans, RVs, etc. can drive through in the middle of the road where the clearance is higher. A fee of $15 per vehicle (2019) is charged, which allows for two trips in a seven day period. The tunnel runs through rock close to the edge of the sheer cliffs on the south side of the canyon, and every so often a window in the side gives a brief view of the valley below, though stopping to take photographs is not permitted. The highway emerges from the east end of the tunnel to a bridge over Pine Creek, now a shallow slot canyon, though the drainage deepens dramatically downstream, and is one of the most popular locations in the park for technical canyoneering. 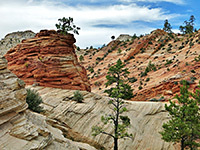 Pine Creek soon turns away to the north, but the major tributary of Clear Creek continues eastwards, forming a spectacular valley framed by huge cliffs and buttes, all within the park boundary, and including many large white rounded domes with intricate criss-cross striations, such as the famous Checkerboard Mesa. The canyon extends for six miles, becoming gradually shallower, and is followed by the road, which is narrow and winding, often with sheer rock walls at one side and a steep drop to the streamway at the other. There is a second, much shorter tunnel, and a limited number of verges for parking. 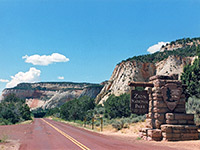 The remaining nine miles of the road to Mount Carmel Junction is beyond the park boundary, but still very scenic, passing more cliffs and canyons, and also Zion Mountain Ranch, home of a herd of bison. 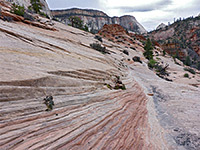 Within the park are several roadside parking areas but only two official trails; one easy and rewarding path leads to Canyon Overlook from which the Pine Creek fork of Zion Canyon may be seen, stretching into the distance, while the other is the East Rim Trail, a ten mile route that climbs up several canyons then crosses mainly flat, forested land before descending to the Virgin River via Echo Canyon. 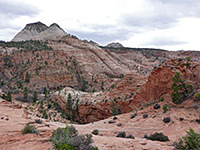 One other destination, becoming more well-known in recent years, is the short technical slot of Keyhole Canyon, while there are at least a dozen other side ravines, all inviting exploration, plus much undulating slickrock. Anywhere along the road in the Clear Creek canyon is photogenic. The southeast section of the national park also contains Parunuweap Canyon - formed by the East Fork of the Virgin River, this is almost as spectacular as the main valley but is trailless and virtually inaccessible. 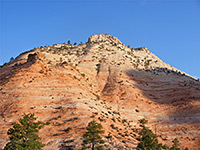 Beyond the park boundaries are more dramatic, remote canyons such as Mineral Gulch and Poverty Wash.